On Friday night Stu and I went to see Carnage at the Hackney Picturehouse. 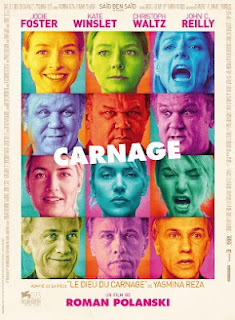 It was a black comedy film co-written and directed by Roman Polanski, based on the play God of Carnage by French playwright Yasmina Reza. The film involved two couples who meet to talk about their sons playground fight and although initially very civil the rendez-vous soon descends into a slanging match. It was short at just 80 mins, very staged but very well played by Jodie Foster, John C. Reilly, Kate Winslet and Christoph Waltz.